Bacon-Jalapeno Little Smokies: easy-peasy crockpot recipe with an enormous dose of flavor! Stuffed Mushrooms: fill with sausage, cream cheese, and spinach (if you need them to be “healthy”) and pop them in your mouth like candy! Veggie-Ranch Pizza: This is less “pizza” and more a perfectly open-faced veggie sandwich. It’s practically salad. Spinach Dip (with fresh bread and/or veggies): One of my all time favorites, to make this stretch a little farther, add more spinach! 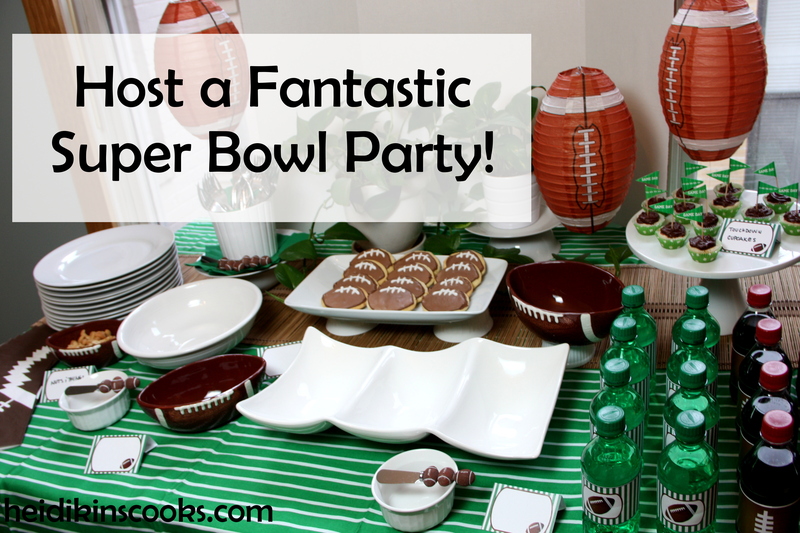 Tablescape Tuesday: Host a Super Bowl Party! Like most of America, every year on Super Bowl Sunday I get together with a group of friends to watch two teams of men pummel each other. Unlike most of America (or at least a significant percentage?) I couldn’t care less which teams are playing, who wins, who performs at halftime, or what is the funniest/most offensive commercial. I am only there for the food. 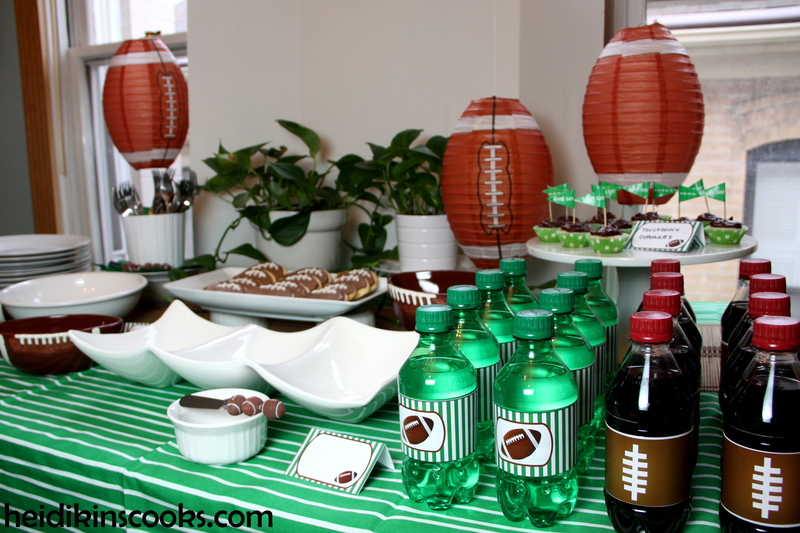 For me, Super Bowl Sunday is just another excuse to plan a party, and I was surprised at what I was able to round up to put together a truly fantastic and sporty-looking buffet table. Now, I realize that many Super Bowl parties are more the “giant bag o’ Doritos and cooler of drinks” variety. But that is no fun for me whatsoever (either the menu selection or the set up), so I went all out instead. Start with a tablecloth, this one is from IKEA a few years ago (this color no longer available), but there are dozens of plastic ones online or in any big box store. I anticipate lots of saucy, hot, and otherwise heavy food for Super Bowl Sunday, so I opted to use real plates and utensils. I found these football bowls on clearance last year and they make the whole thing more festive, this particular set isn’t available anymore, but there are lots of options to choose from. 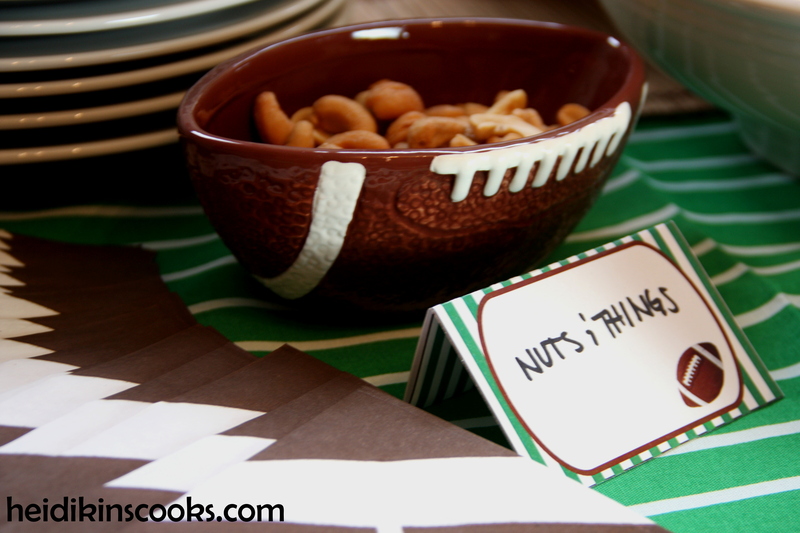 The football-print napkins are from Target (this year). The paper lantern-like hanging footballs are an Amazon find, and I love how they make this all look (even though, again, I don’t particularly care about football). If your parties are anything like mine, you will have tons of food to pick from, so I like making mini cupcakes so people will still have room for everything else. 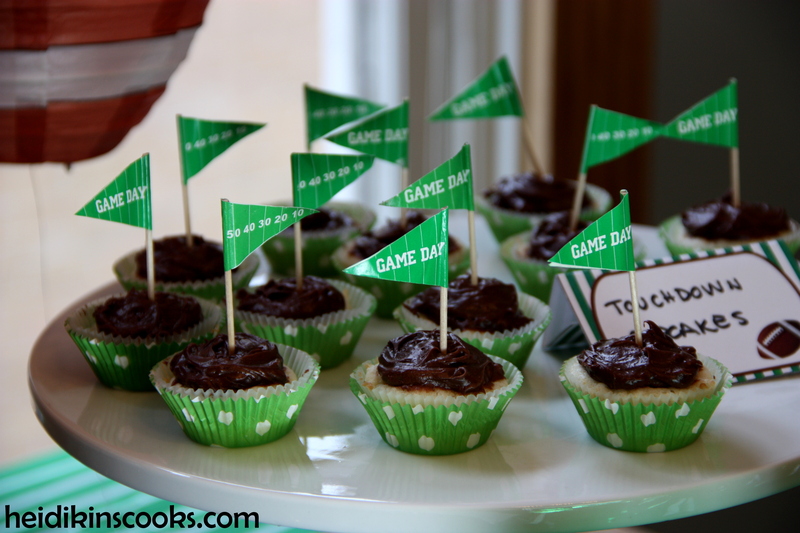 These little Game Day flags are just so cute. Can football and cute go together? I hope so. Hold up! Heidikins is getting crafty! 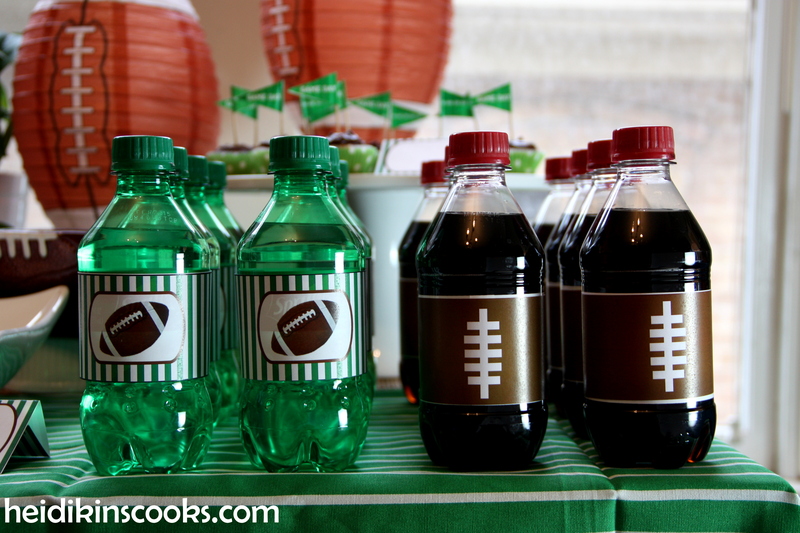 You can add these free printables to cola or soda or water bottles, here is the football one, and the green stripey one. I also made some free printable food table tents (print on to construction paper!) to help demystify your pot luck table. 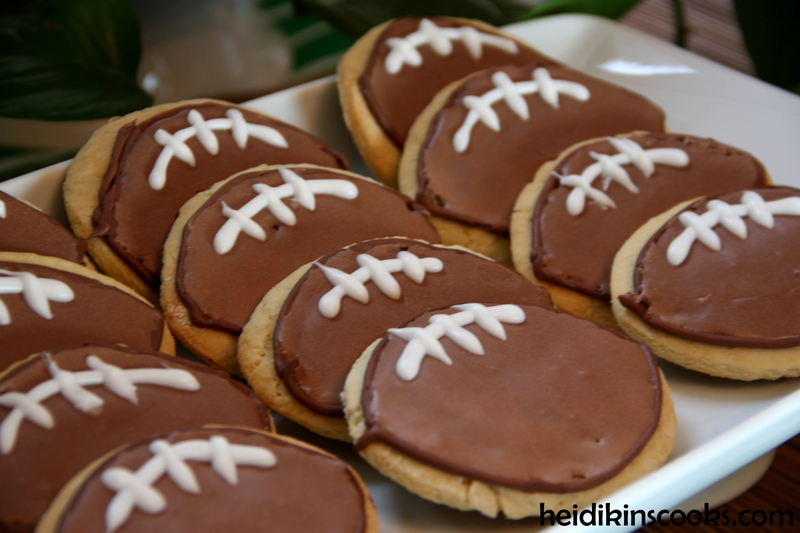 An almond-shaped cookie cutter and some chocolate royal icing (sub 1/2-1 cup of powdered sugar for cocoa powder) make tiny edible football cookies. A few pieces of white serving ware, small ramekins for sauces and spreads and dips (including these football-handle spreaders) and you are ready for game time! Or, you know, if you are like me and don’t give a hoot about the actual game, it’s time to plan your next party. Go Sports! On a gray January weekend I sometimes have to deliberately cheer myself up enough to get out of bed. Dreams of this grown-up Ramen were enough to get me up and chopping (although, it must be said, not enough to get out of my slippers). 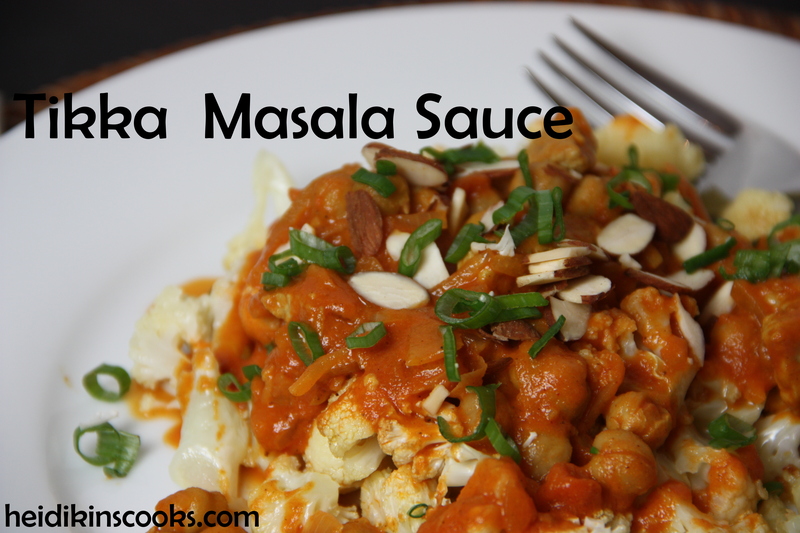 I’m sure this would be equally delicious with chicken, and you could add noodles or other veggies if you wanted to and your New Year’s diet resolutions allowed. 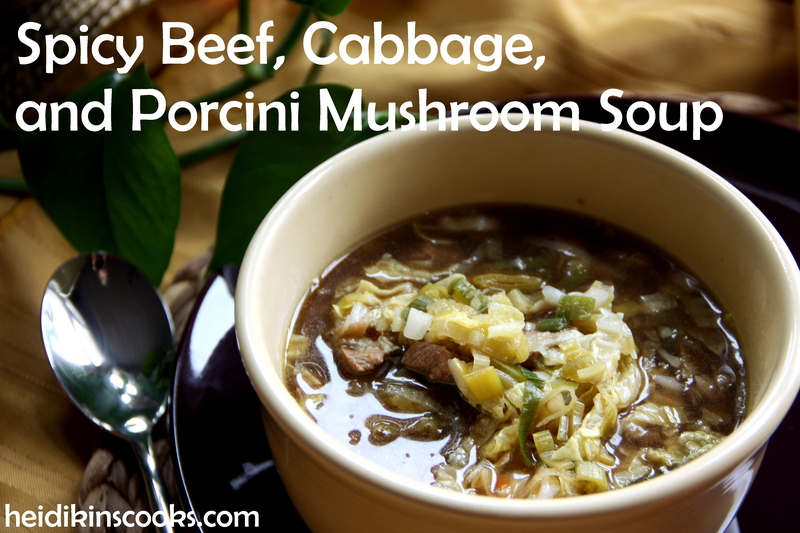 Add the meat, mushrooms, stock, soy sauce, and cooking wine and bring to a boil, then reduce heat and let simmer, covered, for 10-15 minutes. 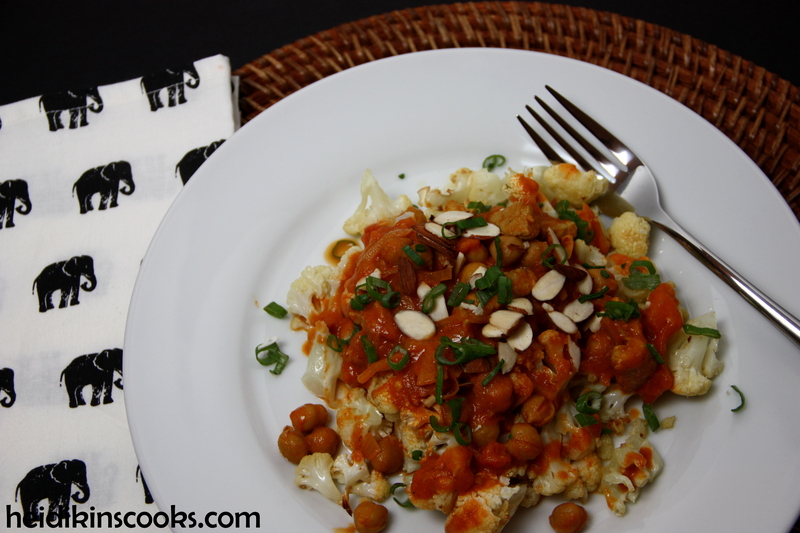 Add chopped cabbage and let cook 5 more minutes until it is soft. Taste and season again with salt and pepper. If this is too vinegary, you can add a teaspoon of sugar to fix that right up. Blue Danube is an old china pattern with quite the history ranging from production in Germany to Japan. On eBay you can find dozens of pieces for pretty decent prices. I really love this, and have since the first time I spotted it. After looking for a couple of months I found a fantastic deal on a set of salad plates with scalloped edges and free shipping. 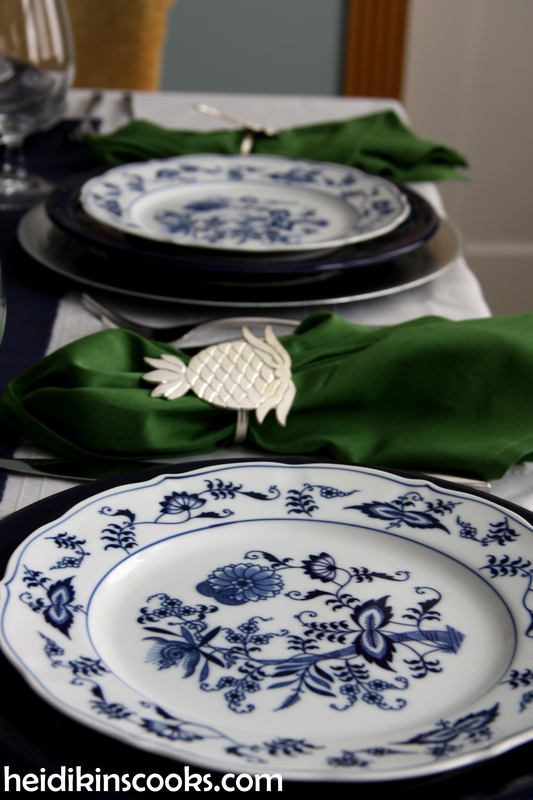 I snapped them up immediately and love mixing this traditional pattern with my cobalt Fiesta plates and some pineapple napkin rings. Don’t worry. Eclectic-chic is totally a thing. Wink. 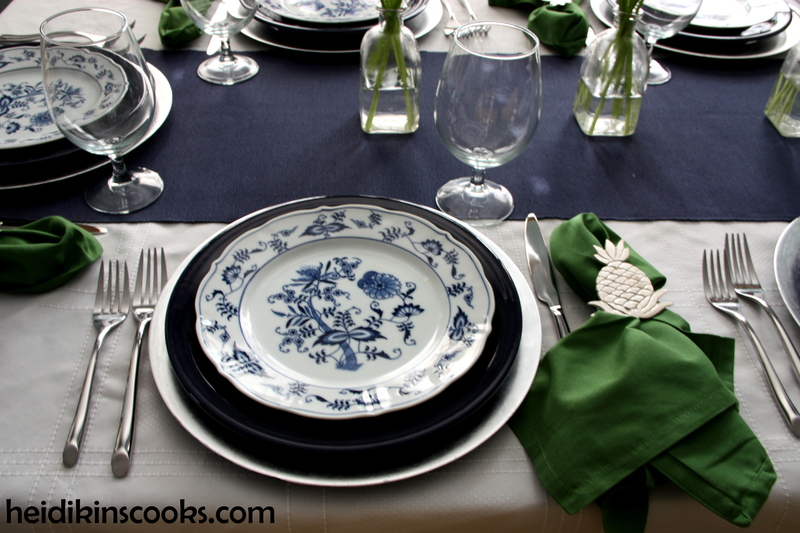 I started this setting with a white table cloth topped by a navy blue runner. 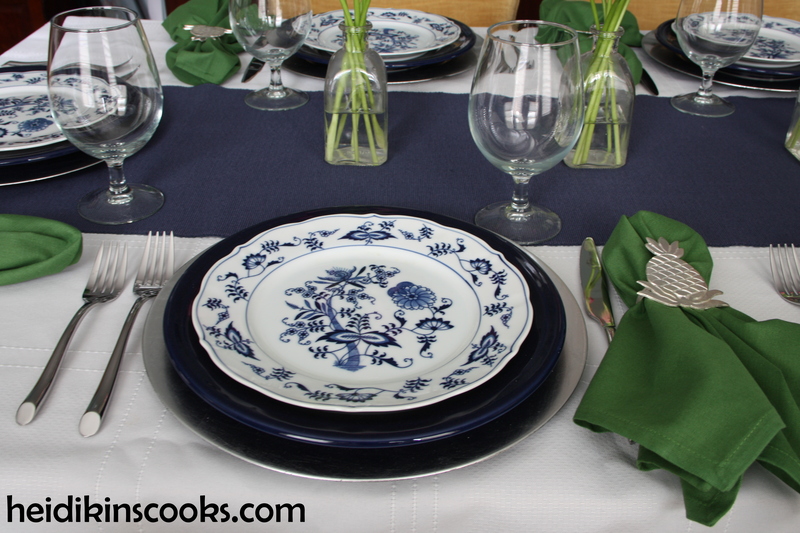 I used silver chargers that I picked up for $0.50 each at Tuesday Morning and my beloved Cobalt Blue Fiestaware dinner plates. After twelve years of daily use I have finally replaced my old flatware with these fancy modern pieces called Towle Living Wave. I love how sleek they are and the weight is just perfect in your hand. 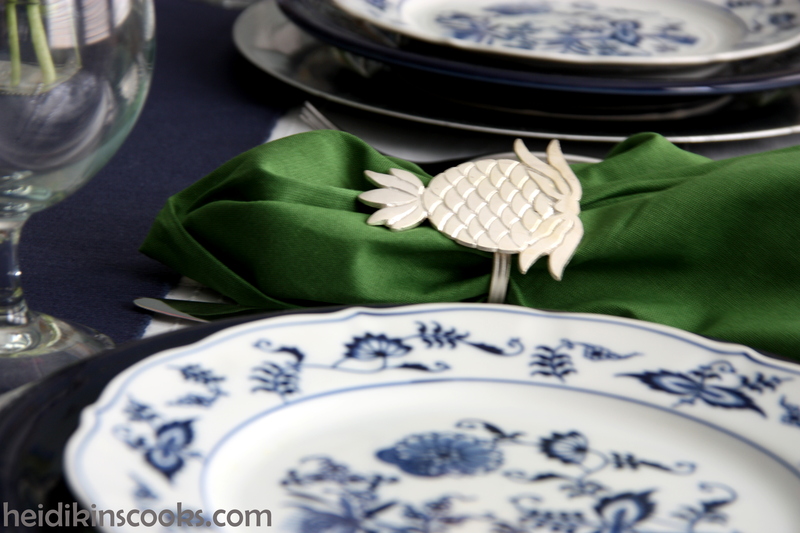 Bright green napkins and shiny silver pineapple napkin rings keep this from being too serious or too wintery. 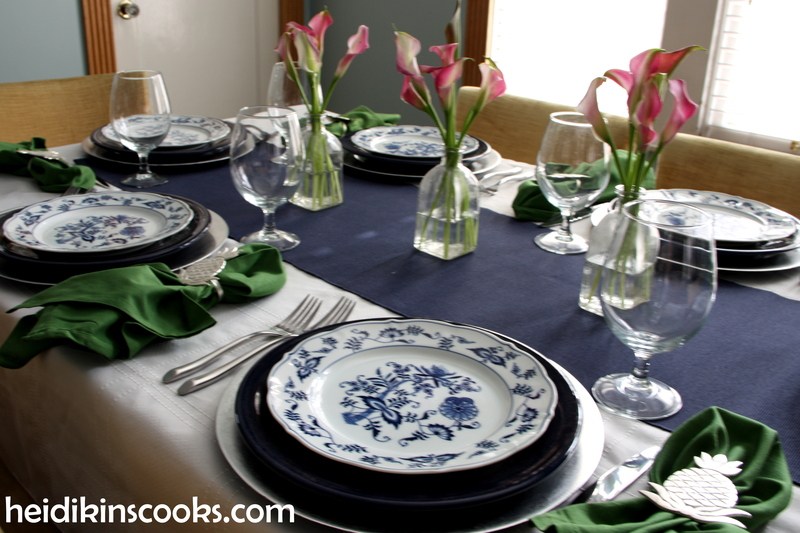 After days of gray gloom I couldn’t handle a fully winterized table setting. Miniature pink calla lilies? Yes please, I’ll take two bunches. 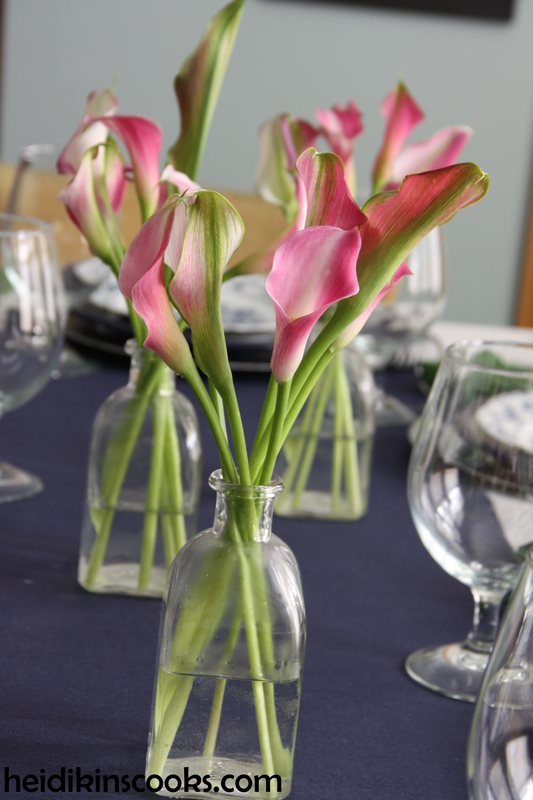 Simple and elegant in small bottles, these really help this table seem more spring-like.